Annette Hassell | “Everything Stops for Tea” | Acrylic on canvas | 14” x 18″ | $1500. 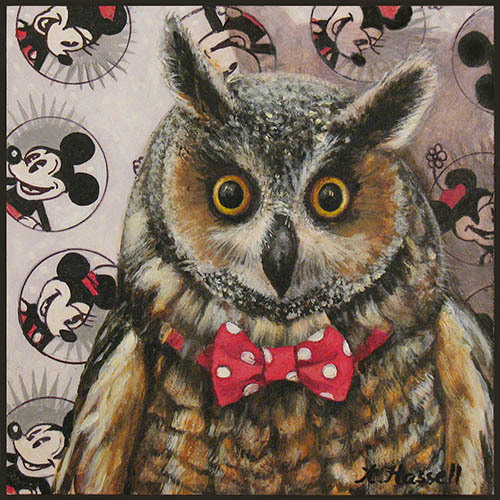 Annette Hassell | “Owl’s Obsession” | Acrylic and ink on board | 5” x 5″ | $220. Annette Hassell grew up in the wonderfully spooky city of New Orleans. While other kids were running about in the fresh air, she was huddled inside ; avidly reading any fantasy or fairy tales that she could find, and then trying to illustrate what she had read. She fell in love with the work of classic illustrators of children’s literature. Rackham, Detmold, Dulac, Nielsen, and Tenniel put faces to the characters that she loved in all the old stories. Annette continued to draw avidly and on her own, and her work consisted mainly of pen and ink renderings of mermaids, fairies, and Tolkein characters. Then she attended the University of New Orleans, where she fell in love with painting and where – in 1986- she received a Bachelor of Fine Arts Degree. Immediately thereafter, she began working as a Mardi Gras float painter and designer. While she worked on her own paintings here and there, she didn’t really decide exactly what it was that she wanted to paint until she moved to Los Angeles in 1996, where she started painting her rather unconventional still lifes and portraits. Today, Annette likes to find the humor in life. She uses her characters-animals, dolls, odd toys, haunted figures from old photographs-to portray everyman. She also revels in the technical aspects of painting ; rendering different textures, patterns, and surfaces, as thoroughly as she is able, and thereby giving a weightiness to the fantasy. Annette wants to make sure that her paintings imply a narrative. 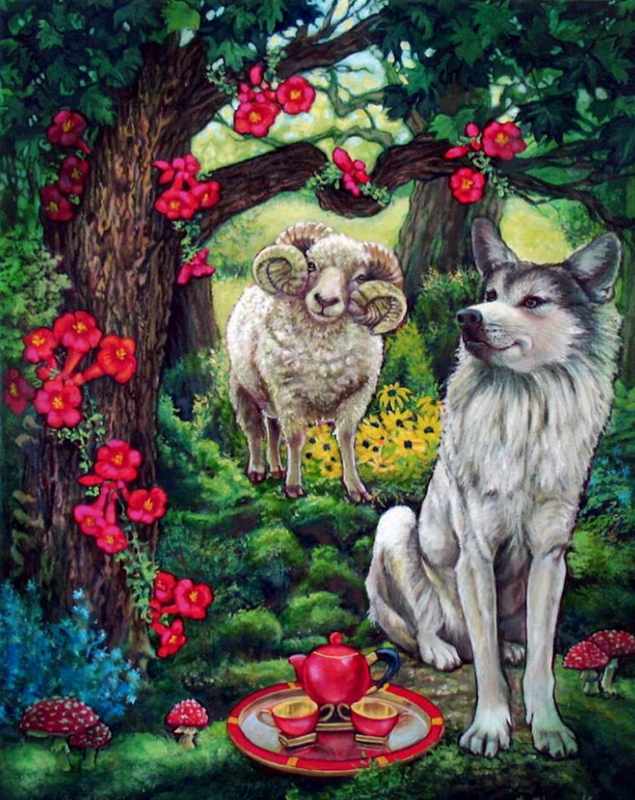 She tells her own stories now through her paintings, and infuses them with personality, mood, atmosphere and meaning, harkening back to those wonderful, magical stories and illustrations that she so loved as a child. Annette currently resides and works as a scenic artist for theater, television and film in Los Angeles. Her first love continues to be creating and telling her own stories through her paintings.